Comprising four intriguing novella length contemporary adult fantasy stories which contain mystery, a hint of the supernatural or paranormal, together with a passing nod towards philosophy and religion - though in these modern fairy or folk tales the fantastic doesn't happen in some remote fantasy world, but right here in this one, in very ordinary, almost everyday circumstances! I've deliberated for quite a while over how to both rate and review The Red Grouse Tales. As it is an anthology of four of Leslie W.P. 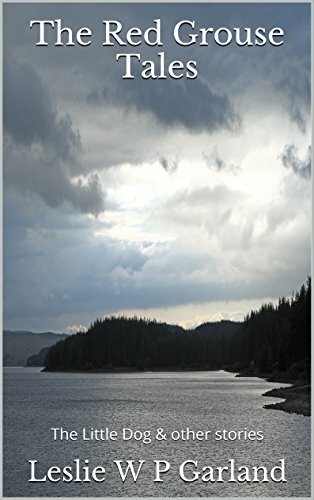 Garland's short stories, I will review the book as a whole and as separate stories but as with all short stories, do bear in mind that I may have liked a story that may not appeal to others and vice versa. Such is life and it would be boring if we all liked the same things! I loved the idea of The Red Grouse Tales: stories that friends told each other over a pint in their local pub. The four stories are: The Little Dog, The Crow, The Golden Tup and The White Hart. Each story is different and surprisingly thought provoking with hints of theology, philosophy and fantasy interwoven into them. The Little Dog kicks off the anthology with a dark supernatural mystery. I felt chilled by the character of Stan and feared for Bill's safety when he was partnered with him at work. As the end of their shift together drew near, I felt relieved for Bill at the thought of him parting ways with Stan and his black heart. I found the story quite slow to start but I loved the character of the little dog sitting on the roadside and Bill's pleasure at seeing him in the same spot every day. The Little Dog gets a 3 star rating from me. I felt that the way the speech was written and the constant repetition of 't' be sure' to be a bit condescending. I would have felt the same had an attempt been made to write Scottish or even Geordie accents into the written word. I just wanted Dave to put a pillow over Father Patrick's face to put me out of my misery. Sadly, The Crow only gets 1 star from me. Thankfully, I never give up on a book so I laboured on and I was delighted to find that the next story, The Golden Tup, really appealed to me. It's mysterious, intriguing and very dark; there's definitely evil lurking in Burnhope farm and I loved the way that Verity told the tale - I could imagine her recounting the story with a torch held up to her face to add to the creepiness. The Golden Tup gets a solid 4 star rating. For me, Leslie W.P. Garland definitely saved the best to last; The White Hart left me with goosebumps and I thought the writing was excellent. It was slightly spooky, philosophical and humorous, with Pete Montague appearing as a modern day Romeo. I loved how the three threads of the story were plaited together with not a hair out of place and I would easily give this story a 5 star rating. Variety is the spice of life and from the various ratings I have given each story, you can see that there are quite a variety of stories in The Red Grouse Tales. There really is something for everyone and although I clearly enjoyed some stories more than others, I think that's normal in a collection of vastly different tales. I would definitely recommend you pick up The Golden Tup and The White Hart, if you're a fan of novellas.